Prince Dreambert (usually called simply Dreambert) is a Pi'illo that appears in the game Mario & Luigi: Dream Team. He is the prince of the Pi'illo people and thus, was among those who were petrified by Antasma; fortunately for the Pi'illo people, he is also the first to be freed of his rocky prison, as Mario and Dreamy Luigi (at that moment, are trying to rescue the recently-kidnapped Princess Peach from Antasma) free him from the Nightmare Chunk, which contains him in the Dream World, by jumping at it. 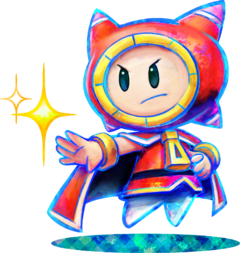 He acts as a guide (mainly in the Dream World) for Mario and Luigi and travels with them for the majority of the game. Prince Dreambert explains to Mario and Luigi about how his people were trapped. Dreambert explains to Mario, Luigi, and Starlow that there are two powers in the Dream World: the Dream Stone and the Dark Stone, the latter of which was destroyed by Antasma and used to petrify the Pi'illos so thoroughly that they were presumed extinct. Dreambert requests that the three help free the other imprisoned Pi'illos as they search for Princess Peach. In-game, he explains to Mario how to use Luigi's dream powers to navigate the Dream World. He helps the brothers on the adventure along with Starlow. Prince Dreambert appears as a Spirit in Super Smash Bros. Ultimate. Website bio: "Prince Dreambert is the prince of the trapped Pi'illo Folk. He needs Mario and Luigi's help to save his people from a stony fate as petrified pillows." European website bio: "Prince Dreambert is the prince of the Pi'illo folk! It's not long before he enlists Mario and Luigi's help to save his people from a stony fate!" Yumeppu Deviation of the word "yume" (夢), meaning "dream". French (NOE) Prince Tédibert Pun on "Teddy bear"
Dutch Prins Dreambert Name from the English version, prins means "prince". Portuguese Oniriberto From "onírico" (oneiric) and "Roberto", Portuguese, Italian and Spanish for "Robert". Deurimpeu Portmanteau of "dream" and a first syllable of the word "prince". This page was last edited on December 25, 2018, at 03:21.